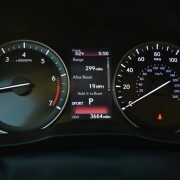 This sedan isn’t outstandingly fast in a straight line. 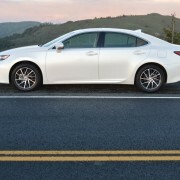 Nor does it corner with sports sedan agility. 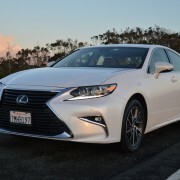 But if there’s one thing the mildly refreshed 2016 Lexus ES350 does really well, it’s playback music. 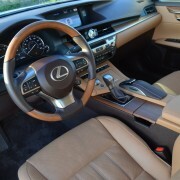 Lexus equipped our $38,000 test vehicle with the $2,650 optional Navigation System/Mark Levinson Premium Audio Package. This entertainment center positions 15 speakers inside the cabin and feeds them with an 835 watt premium surround sound system that made Subterranean Homesick Blues sound like Bob Dylan was sitting on the dash. 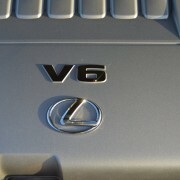 It was the one unforgettable impression this Lexus made during its very wet week in our driveway . 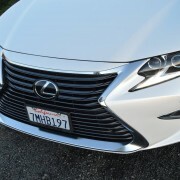 Lexus stylists have updated the appearance of the ES to mirror the wide mouth bass look of the company’s other products. This year, the ES receives the full spindle grill treatment. 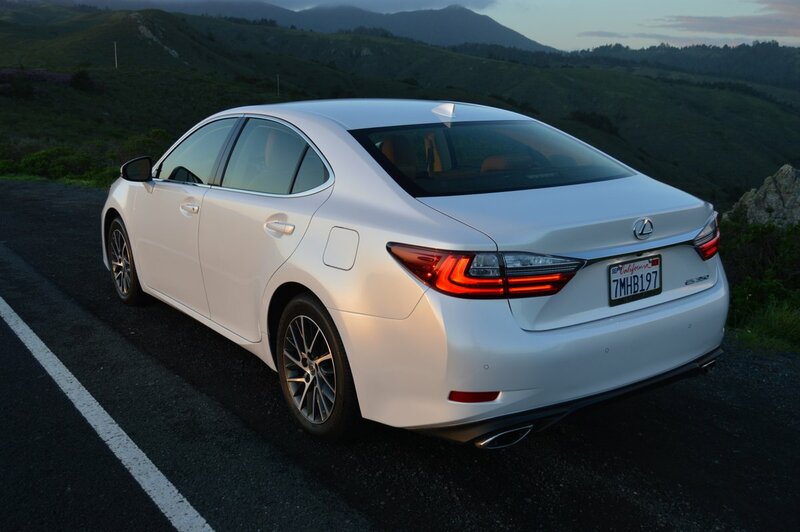 Gone is the horizontal bar differentiating upper and lower front fascia sections. 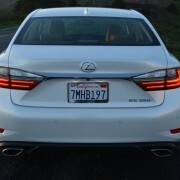 Both headlights and tail lights now feature subtle “L” motifs in their design. 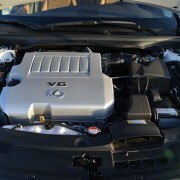 At the rear, an undercar diffuser incorporates new twin chrome plated exhaust finishers. 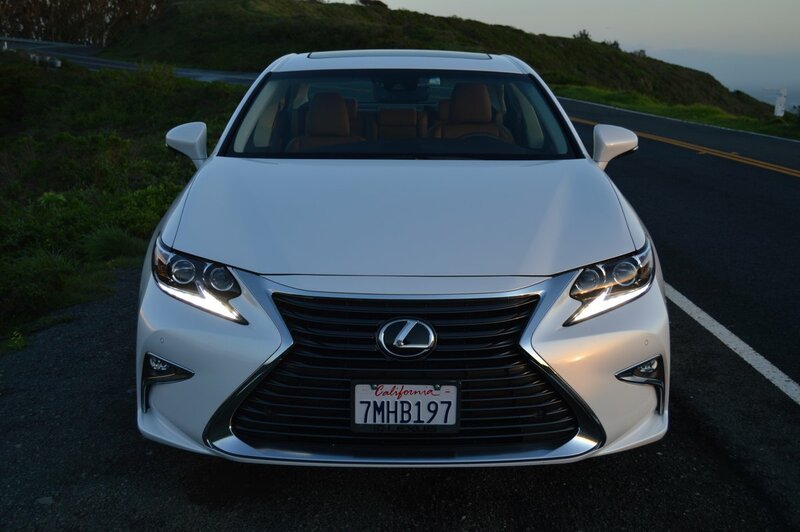 With the exception of the gaping front grill, the evolved styling of the ES pleases the eye. However, the biggest change takes place in the interior, where the formerly understated ES now takes on more of a lavish personality. This upgrade is especially apparent if you order the optional ($1,670) Luxury Package, which provides perforated leather seats with embossed stitching, a power tilt and telescoping steering wheel, and a mirror-seat memory system for the driver offering three setting choices. The steering wheel in our ES was a real work of art. 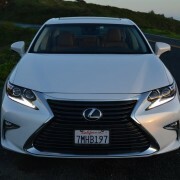 First, Lexus improved its appearance by making it sportier looking. Secondly, our rim was heated at the handgrip positions, and fitted with matte bamboo on the remainder. The bamboo sections were not heated however, which led to much gripping of the leather sections on cold mornings. 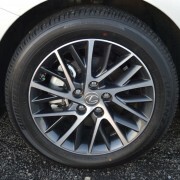 Lexus has fitted the heater on the wheel with a timer that automatically turns the feature off with no warning. The 3 position seat heaters (and ventilators) stay on indefinitely, however, including after restarts. Whenever you trigger the ignition stop button, the driver’s seat shoots rearward while the steering wheel lift itself up and away. This annoying valet routine seems immune from disablement by the owner, since no “car settings” menu mentioned it at all. After you light off the ES’ 268hp V6, the driver’s seat scurries back to its preordained position, and that expensively detailed steering wheel settles into your hands. Although the ES provides adequate grunt for most passing situations, you will never be overwhelmed by an abundance of power here because the ES weighs in at 3,575 pounds. The power-to-weight ratio stands at 13.3 pounds per horsepower. 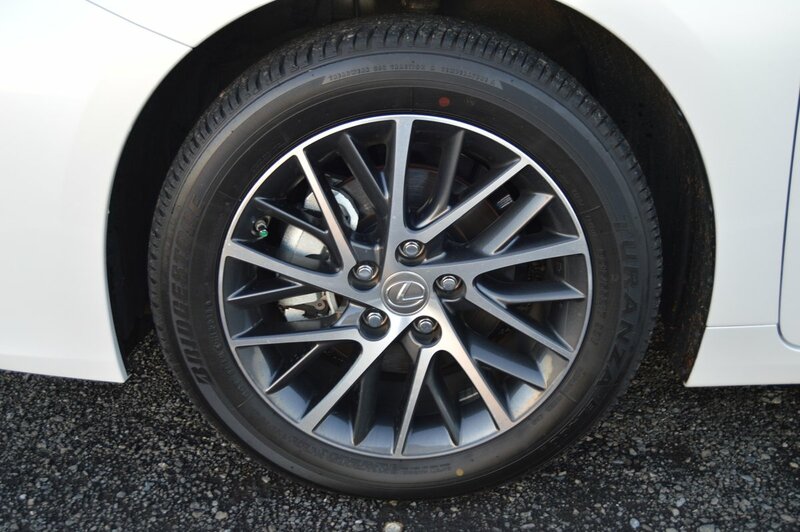 In a sedan world where 225mm-275mm is the normal section width for tire size, the Lexus ES350 is decidedly under-tired. All four Bridgestone EL400 Turanza tires measure just 215/55R17. Their skinny footprint barely fills out the ES350′s fender wells. The message here is that the ES is designed more for straight line work than attacking backroad zig-zags. 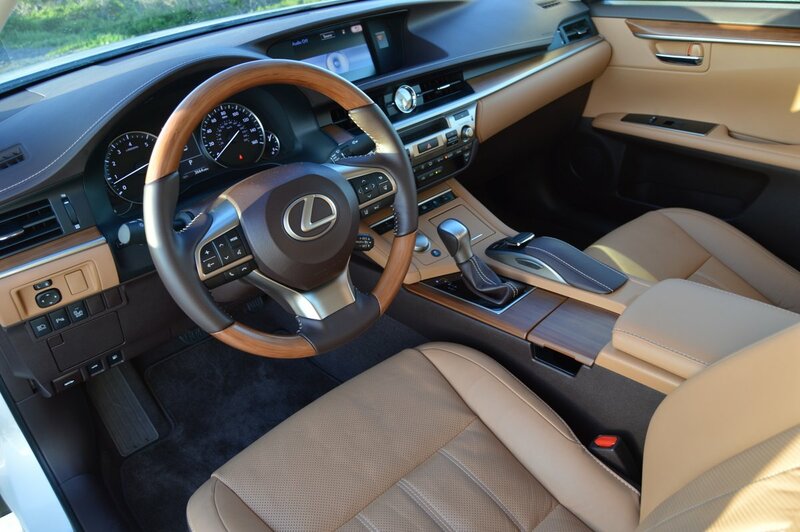 Lexus does give you the opportunity to dial up a “Sport” setting from the console-mounted “Drive Model Select” but any difference in feedback is so subtle as to be virtually imperceptible. 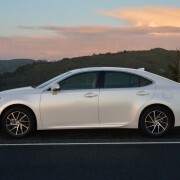 On the other hand, the feedback from the “Steering Assist” that is part of the $1,015 optional Lexus Safety System will drive you nuts in short order. 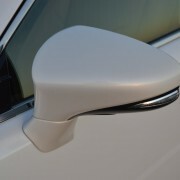 This gratuitous mechanism shakes the wheel in your hand every time you change lanes without using your turn indicator. 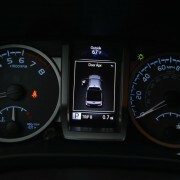 It also wobbles the wheel whenever you touch a center line or dive for an apex on a twisty road. Do yourself a big favor and eliminate this annoyance from your build selection sheet. 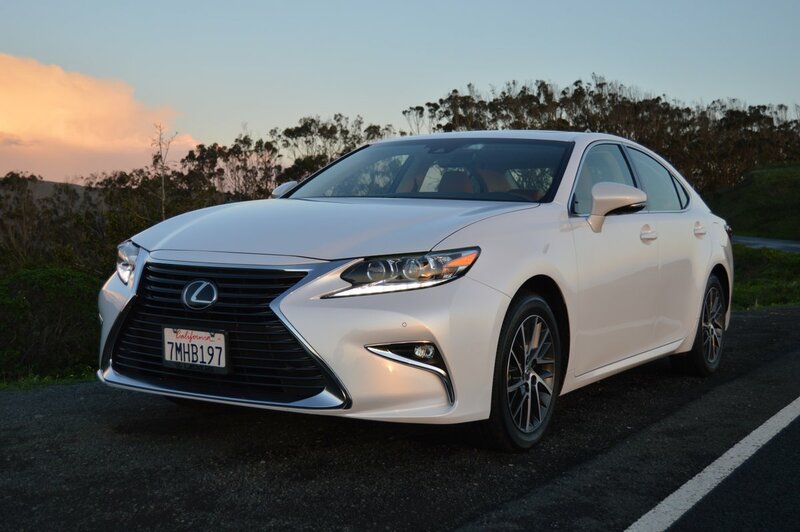 The ES350 has always Lexus’ entry level sedan, a warmed over version of Toyota’s best selling Camry. 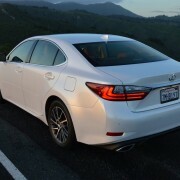 This year, the Lexus Division has moved its ES350 cover of the Camry to much higher ground, with a pleasing exterior refresh, and an interior redo that make it much harder to discern its humble Toyota origins.